Personal protective equipment is to be used as a control measure as a last resort. It does not eliminate the hazard and will present the wearer with the maximum health risk if the equipment fails. Successful use of personal protective equipment relies on good user training, the availability of the correct equipment at all times and good supervision and enforcement. For all types of PPE there are some basic standards that should be reached. The personal protective equipment should be fit well, be comfortable to wear and not interfere with other equipment being worn or present the user with additional hazards (e.g. impaired vision due to scratched eye goggles). Training in the use of particular personal protective equipment is essential so that it is not only used correctly, but the user knows when to change an air filter or to change a type of glove. Supervision is essential, with disciplinary procedures invoked for non-compliance with personal protective equipment rules. It is also essential that everyone who enters the proscribed area, particularly senior managers, wears the specified personal protective equipment. Respiratory protective equipment can be subdivided into two categories: respirators (or face masks) that filter and clean the air, and breathing apparatus that supplies breathable air. 1. A filtering half mask – often called a disposable respirator it is made of filtering material. It covers the nose and mouth and removes respirable size dust particles. It is normally replaced after 8-10 hours of use. It offers protection against some vapours and gases. 2. A half-mask respirator - made of rubber or plastic and covering the nose and mouth. Air is drawn through a replaceable filter cartridge. It can be used for vapours, gases or dusts but it is very important that the correct filter is used, as a dust filter will not filter vapours. 3. A full-face respirator - similar to the half-mask type but covers the eyes with a visor. 4. 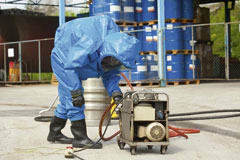 A powered respirator - a battery operated fan delivering air through a filter to the face mask, hood, helmet or visor. 1. Self contained breathing apparatus - where air is supplied from compressed air in a cylinder and forms a completely sealed system. 2. Fresh air hose apparatus - fresh air is delivered through a hose to a sealed face mask from an uncontaminated source. The air may be delivered by the wearer, by natural breathing or mechanically by a fan. 3. Compressed air line apparatus - air is delivered through a hose from a compressed air line. This can be either continuous flow or on demand. The air must be properly filtered to remove oil, excess water and other contaminants and the air pressure must be reduced. Special compressors are normally used. The selection of appropriate respiratory protective equipment and correct filters for particular hazardous substances is best done by a competent specialist person. Filters and masks should be replaced at the intervals recommended by the supplier or when taste or smell is detected by the wearer. The performance of RPE with a tight-fitting face piece depends on a good contact between the wearers skin and the face seal of the mask. However, research by the British Safety Industry Federation indicated that up to 50 per cent of all respiratory protective equipment used does not offer the wearer the level of protection assumed, usually because it is not fitted correctly. Many regulations state something like ‘Employers should ensure that the selected face piece is of the right size and can correctly fit each wearer. For a tight fitting face piece, the initial selection should include fit testing to ensure the wearer has the correct device. Also, employers must ensure that whoever carries out the fit testing is competent to do so’. Fit testing is needed when RPE is used as a control measure not when it is worn by choice for comfort. Fit testing should be repeated if the shape of the face of the wearer changes for any reason, such as weight loss or gain. Re-testing is recommended to check that the face piece remains suitable and that the wearer is taking care to wear and remove the mask correctly. A two-year cycle has been suggested, and a one year retest is suggested for work with asbestos. Fit testing can be qualitative or quantitative. Qualitative testing involves a simple pass or fail based on whether the user can taste or smell a harmless aerosol or odour through respiratory protective equipment. Qualitative testing is only appropriate for disposable or half face masks. A quantitative fit test may use a laboratory test chamber or a portable fit test device, and produces a numerical ‘fit factor’ measure. The results of fit tests should be recorded. Fit test records must be made available to authorities on request, and to the employees who wear respiratory protective equipment. Respiratory protective equipment should be checked every time that it is used to make sure it has not been damaged and is being worn correctly. All respiratory protective equipment should be examined at least once a month except for disposable respirators. A record of the inspection should be kept for at least five years. There should be a routine cleaning system in place and proper storage arrangements. Hand and skin protection is mainly provided by gloves (arm shields are also available). A wide range of safety gloves is available for protection from chemicals, sharp objects, rough working and temperature extremes. Many health and safety catalogues give helpful guidance for the selection of gloves. For protection from chemicals, including paints and solvents, impervious gloves are recommended. These may be made of PVC, nitrile or neoprene. For sharp objects, such as trimming knives, a Kevlar-based glove is the most effective. Gloves should be regularly inspected for tears and holes since this will obviously allow skin contact to take place. Another effective form of skin protection is the use of barrier creams and these come in two forms: pre-work and after-work. Pre-work creams are designed to provide a barrier between the hazardous substance and the skin. After-work creams are general purpose moisteners which replace the natural skin oils removed either by solvents or by washing. Eye protection comes in three forms: spectacles (safety glasses), goggles and face visors. Eyes may be damaged by chemical and solvent splashes or vapours, flying particles, molten metals or plastics, non-ionising radiation (arc welding and lasers) and dust. Spectacles are suitable for low risk hazards (low speed particles such as machine swarf). Some protection against scratching of the lenses can be provided but this is the most common reason for replacement. Prescription lenses are also available for people who normally wear spectacles. Goggles are best to protect the eyes from dust or solvent vapours because they fit tightly around the eyes. Visors offer protection to the face as well as the eyes and do not steam up so readily in hot and humid environments. For protection against very bright lights, special light filtering lenses are used (e.g. in arc welding). Maintenance and regular cleaning are essential for the efficient operation of eye protection. When selecting eye protection, several factors need to be considered. These include the nature of the hazard (the severity of the hazard and its associated risk will determine the quality of protection required), comfort and user acceptability, compatibility with other personal protective equipment, training and maintenance requirements and costs. Protective clothing includes aprons, boots and headgear such as hard hats and bump caps. Aprons are normally made of PVC and protect against spillages, but can become uncomfortable to wear in hot environments. Other lighter fabrics are available for use in these circumstances. Ensuring workers comply and correctly wear protective clothing can be expected to increase based on the comfort of the clothing system being worn. Being comfortable in their clothing allows workers to focus on the task at hand and helps promote safe workplace behaviour. Discomfort from a clothing system may lead to premature worker fatigue and may increase the risk of accidents and personal injury. When choosing a clothing system, all of these factors must be considered, as well as the nature of the workers’ specific tasks. One must also consider the potential change in environmental conditions that can happen during a typical day. In the winter, for example, both indoors and out, it’s not uncommon for the days to start out very cold and reach a more pleasant working temperature by midday. Safety footwear protects against falling objects, collision with hard or sharp objects, hot or molten materials, slippery surfaces and chemical spills. It has metal toecaps and comes in the form of shoes, ankle boots or knee-length boots and is made of a variety of materials dependent on the particular hazard (e.g. thermally insulated against cold environments). It must be used with care near live and unprotected-against electricity. Specialist advice is needed for use with flammable liquids. The footwear must have the correct grip for the environment, a hard wearing sole unit and possibly a good shock absorbing capability. It is important to note that appropriate PPE should be made available to work related visitors and members of the public visiting workplaces where hazardous substances are being used. It is also important to stress that managers and supervisors must lead by example, particularly if there is a legal requirement to wear PPE equipment. Refusals by employees to wear mandatory PPE must lead to some form of disciplinary action.